Everyone needs love. Animal lovers know that incredible bonds can be forged across species. Interspecies relationships are probably one of the most adorable things on the planet. When an animal of one species steps up to adopt a baby animal of another, our hearts absolutely melt. Make one of those animals a baby pygmy goat, and we are a puddle of emotion! According to her family, Shadow treated the baby goat like it was one of her puppies. This baby goat doesn’t know any better. After all, they are both fuzzy, so why wouldn’t Shadow be her mommy? These two spend their days cuddling, and Shadow is a fan of giving her adorable goat-child lots of baths. 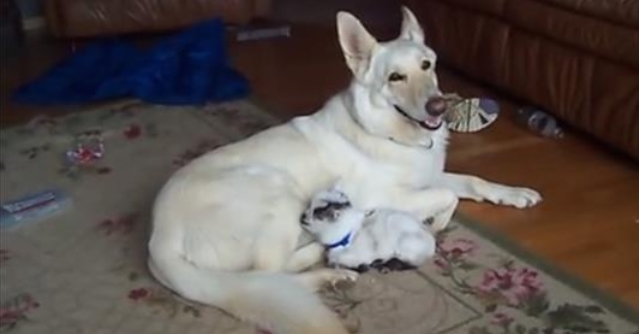 When the camera comes out, Shadow grins ear to ear, proud of her adorable baby. Responses to "Adorable Baby Goat Thinks a German Shepherd is Her Mommy "